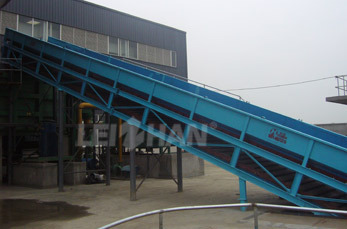 Leizhan offers the optimum conveying solution which is suitable for various raw materials for paper making producer. BFW series chain conveyor is used to convey various raw materials like waste paper, pulp board in both horizontal and inclined application and the incline angle is less than 30. New type BFW series chain conveyor is an ideal waste paper and pulp plate conveying facility for paper mill. To fulfil the needs of the paper producer and technological layout requirements, the transmission installation of chain conveyor is divided into left type and right type. Leizhan can provide different transmission installation type according to customer’s demands. Adopt chain drive one-time impact stamping design. Closed design device to avoid material leaking. Cast steel sprocket to improve wear-resistant. Feeding plate applied to V design to increase raw material capacity. Reasonable structure, large transmission capacity.